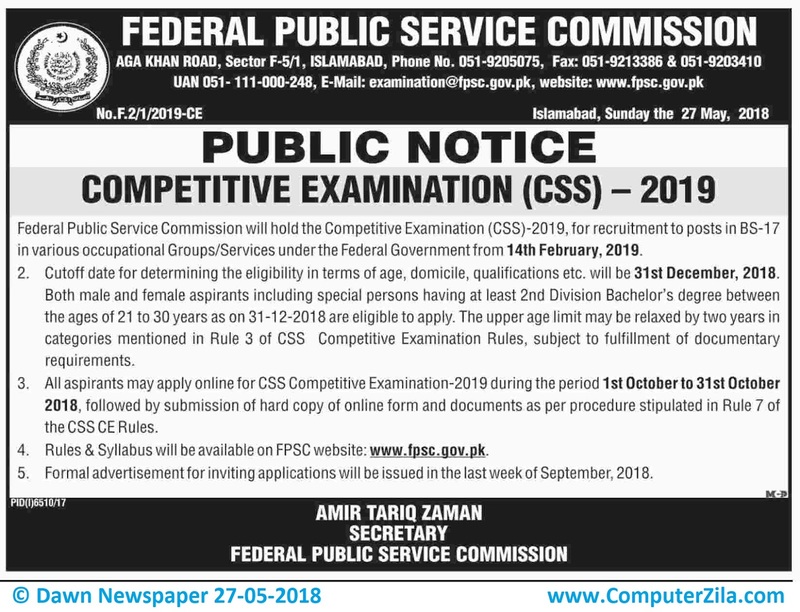 Competitive Examination CSS - 2019 at Federal Public Service Commission (FPSC) in Abbottabad, Faisalabad, Islamabad, Jamshoro, Karachi, Lahore, Larkana, Multan, Peshawar, Quetta, Rawalpindi, and Wah Cities. Federal Public Service Commission is a Government Organization which requires employees for Administrative, Commission, and Civil Servant Jobs in cities Abbottabad, Faisalabad, Islamabad, Jamshoro, Karachi, Lahore, Larkana, Multan, Peshawar, Quetta, Rawalpindi, and Wah. Jobs for Pakistan top most Civil Servants are announced. Public Notice for Competitive Examination (CSS) - 2019 jobs, the Exam will be held on 14th February, 2019 for BS-17, cutoff date for eligibility will be 31st December, 2018. Rules and Syllabus are available at FPSC Website.